Looking to update your kitchen? If you have ever received an estimate to have cabinets refaced or replaced…you may have some sticker shock! A great solution is to repaint them! It is a fraction of the price and totally worth it! The kitchen is one of the rooms in your home that you spend a majority of your time. 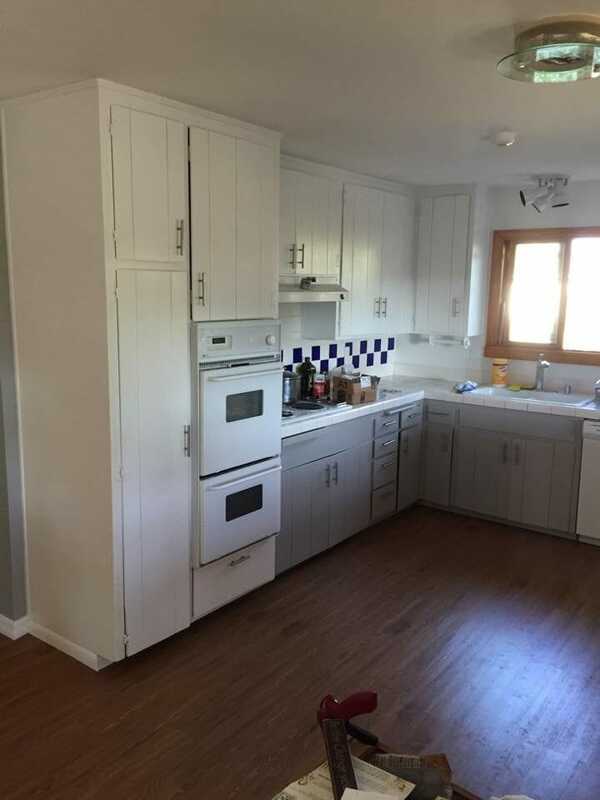 Check out these cabinets on the right. They aren’t very old but the color screams 90’s. Turning old into new! Ugly to beautiful! Cabinets are really one of my favorite projects. It is rewarding to make such a big impact on a room whether it be a kitchen, bathroom vanity, or office. This project comes at the perfect time! My last post I covered how to paint a wooden stained sink cover that was in pretty rough shape. A pretty small project in comparison, but both have a lot in common. Cabinets are a fine finish, high quality, attention-to-detail type of job but the steps are similar. If you plan to DIY check out how it’s done. If you want to sit back and leave it to the pros, give Bulman Painting a call! Here we go! Will you be spraying or brushing, or brushing and rolling? Will you be taking off the hinges or door pulls or knobs? Will you be painting them without removing them or keep them on and paint over them? If you decide to take them off where will you work on them? The type of paint… laquer, oil, or water based and of course what color! The sheen of the paint: low sheen, semi gloss, or gloss? PREP work! I always, always, start any project by prepping the area well. It’s pretty obvious why but you might run across a lazy contractor trying to get a job done at the expense of your floor. 1. Prep the areas you will not want to paint. This can be half the battle, but don’t get discouraged. Use sundries such as painters tape, masking paper, plastic, rosin paper, or drop cloths to cover surfaces. This could include countertops, floors, dishwashers, windows, hardware, etc. All items can be found at any local hardware store. Can you use newspapers, magazines, or carboard to cover the areas? Short answer is yes. But it all goes back to prepping the area you do not want to paint properly. The paper painters use is sturdy and withstands the traffic. So use your judgement when you use other items to cover the no-paint zones. Kitchens are made for cooking, which means grease and food splatters onto the cabinets. I recommend giving them a good wipe down or you may want to clean them with a degreaser. Then we want to sand them! Regardless of weather the cabinets are already painted or stained the purpose of sanding is to give the primer a better “bite”. Basically you want the primer to stick. Typically when a surface is really glossy, paint and primer have a hard time adhering. This will also fix imperfections in the surface. Sanding will remove dirt that is stuck in the previous paint or smooth off any paint that may be peeling. For a project like this I typically won’t use sand paper with a lower grit of 220. After sanding wipe down with a damp cloth. NOTE: If you are using a solvent based paint you will want to use solvent to wipe down the areas you have sanded to remove any dirt or dust. For example, if you are using a lacquer based paint, use lacquer thinner, water based paints, use water, and oil based paints, use paint thinner or mineral spirits. Using the right primer is hugely important!!! I can’t say it enough! If you are unsure of what to use, ask me or another profesional and we can lead you to the right product. You usually can not go wrong with an oil based primer such as Zinsser Cover stain, shown below. I usually always spray cabinets. Unless you have a good reason not to, spraying is so much easier. If you have experience you can use an airless sprayer with a fine tip or HVLP (high volume low pressure) sprayer. If not, I suggest brushing and rolling. A 1/4 inch nap (roller cover) or better yet…a foam roller would be ideal. 4. Time to sand and wipe down…yes, again. Cabinet projects are a favorite. Sanding is not. But this time its just a scuff sand, which is just a light sanding of the surface. I would suggest a finer grit of 320 or higher. NOTE: If you are using a power sander beware of swirls. (Swirls are the pattern left by the sander) They can be pretty noticable if you are not using a grit that is fine enough for the project.The finer the grit the better. If any patching or caulking needs to be done now is the time. Why would you have to patch or caulk? Sometimes there are unsightly gaps between trim, between the cabinets and wall, holes, or marks etc… Then you will need to sand and spot prime those areas as necessary. Make sure to use the caulk you can paint on! Are all the areas you will be painting dust free and primed? If not wipe the areas down with the correct solvent. Re-read step 2 if you can’t remember what a solvent is! Check if there are any other areas that you may have missed and repeat prep work. 2 coats of paint are typically needed and recommended. Allow the appropriate drying time between coats. After the first coat is applied do a super light sand of the cabinet surfaces. You don’t have to use a power sander, you just need a light scuff for the second coat. Make sure the areas are dust free before the final coat of paint and go to town! 8. Once dry, reattach the hinges, knobs or pulls, and cabinet doors or drawers. Clean up! 9. Step back and look at what you did!!! That wasn’t too hard! Was it? Kitchen cabinets are a big project. Let’s see those new kitchen cabinets! Questions? Comment below! No Replies to "Kitchen Cabinet Update"